HAPPY 2015, everyone! I am so super excited about this year. I don't know what it is but for some reason, I just love odd-numbered years (weeeirdo). So, of course, I pretty much live for the beginning of January. 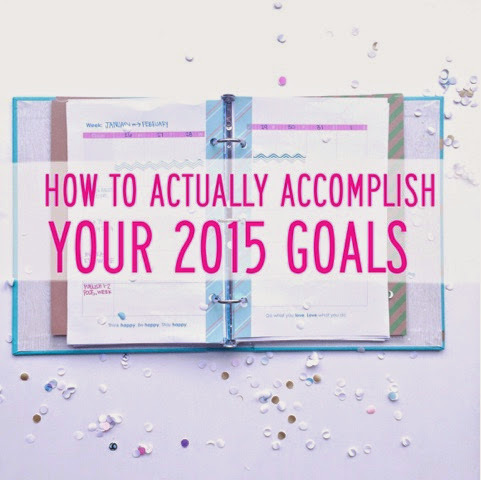 It's the time of year when everyone gets really into setting new goals and organizing everything! The stores are absolutely FILLED with organizational bins and containers (and I break out into my Happy Feet dance whenever I reach the "seasonal" section of Target)! This is also the time when EVERYONE is interested in setting goals and doing things better in the new year! Last January, I wrote a 31-day series (yes, I actually finished that one) about goal setting. I found a ton of great resources (they're listed at the bottom of each post). Today I'm just going to do an abridged, skimming-over version of that series. using some of America's most common resolutions. Turn it into something like this: I will lose 10 pounds by December 2014 by working out 30 minutes each day and doubling the amount of vegetables that I eat each day. Turn it into something like this: I will volunteer 72 hours by December by spending 6 hours a month working in the kitchen at the Mission. Turn it into something like this: I will submit my grad school application by January 15 by working on it for 4 hours next weekend. Turn it into something like this: I will have a job (doing whatever you want to do) by August 1 by submitting a new resume packet to a different company every 2 weeks. Turn it into something like this: I will save $1800 by December by putting $150 into my savings account every month. Turn it into something like this: I will become more relaxed and mindful by December by writing down 10 things I'm thankful for every morning, taking a 30-minute walk outside every day after work, and staying off screens (phone, iPad, computer, TV) between 10PM-6AM. Turn it into something like this: I will take a trip to the Dominican Republic in May by putting $500 into a "vacation fund" every month. Turn it into something like this: I will reduce the amount of items in each closet by 30% by December by going through 1 closet each Saturday and removing 1 of every 3 items every month. See how goals just sound more achievable when we make them super specific? Like, it's no longer this broad ambiguous thing that you hope happens to you this year. Instead, it's something that you're taking control of and working for! When resolutions are super vague, they might as well be wishes. Accomplishing new goals takes a lot of planning (YAY! ), discipline, sacrifice, effort, and doing a lot of things that look really boring when they're written on a daily to-do list (read chapter 5, for example). Just keep your big goal in mind while you're working through those tedious to-do lists. And be prepared to work hard and to sacrifice things that would be fun right now and probably to be broke (if you're saving up for a vacation or paying grad school tuition). So, here is my last little bit of advice before you begin your fresh, new year! Choose to focus on 1 goal at a time and reeeally work to make it a habit before throwing another goal into the mix. Once you're working out daily, or you're in the habit of cooking a healthy dinner every night, then you can start on the resume sending-out, you know? Don't try to start all of your goals at once or you'll just set yourself up for the F word (which is "Failure", obviously). What are your goals for 2015? Did you accomplish the ones that you set for yourself last year? Also, can you think of any resources that I should add for the topics above? I know there have got to be a ton of great apps/websites that I don't know about!